Grace Wu sent me a photograph taken at Taipei Storyland, shown at the right (click on the image for a larger version). "I want to speak the national language, not the topolects." In other words, "Let's speak Mandarin, not Taiwanese, Hakka, Cantonese, etc." This injunction to speak Mandarin at the expense of the regional Sinitic languages ties in with numerous Language Log posts, such as Arnold Zwicky's "How many ethnic groups?" and my own on the "Mutual Intelligibility of Sinitic Languages." Putonghua is the official language on the mainland, but if history had played out differently the vast majority could have been speaking Cantonese. In 1912, shortly after the fall of the Qing dynasty, the founding fathers of the republic met to decide which language should be spoken in the new China. Mandarin – now known as Putonghua [the common language] – was then a northern dialect spoken by the hated Manchurian officials. While it had served as China's lingua franca for centuries, many perceived it as an "impure form" of Chinese. Many of the revolutionary leaders, including Sun Yat-sen, were from Guangdong – which has long been China's land of new ideas. A great debate started between the delegates and eventually led to a formal vote. Cantonese lost out by a small margin to Putonghua and the rest is history. While historians today still argue about the authenticity of the story, it is something Guangdong people love to tell. Many Cantonese speakers feel proud of their native language, saying it has more in common with ancient classical Chinese than Putonghua – which is a mix of northern dialects heavily influenced by Manchurian and Mongolian. Linguists agree to some extent. "Cantonese is closer to classical Chinese in its pronunciation and some grammar," Jiang Wenxian , a Chinese language scholar, said. "Using Cantonese to read classical poetry is a real pleasure," he said. "Many ancient poems don't rhyme when you read them in Putonghua, but they do in Cantonese. "Cantonese retains a flavour of archaic and ancient Chinese. Nowadays few people understand classical Chinese, so Cantonese should be protected as a type of language fossil helping us study ancient Chinese culture." Cantonese is spoken by about 70 million people in Guangdong, Hong Kong, Macau and communities abroad. In the 17th and 18th centuries, Guangdong was the only Chinese province allowed to trade directly with foreigners. Many Westerners at the time learned Cantonese. Up till very recently, there were more Cantonese speakers in overseas Chinese communities than Putonghua speakers. In Canada, for instance, Cantonese is the third most commonly spoken language after English and French. "Speak Putonghua, write standardised characters, use civilised language, be a civilised person." The words are printed on a red banner hanging in the main entrance of a primary school in Guangzhou, a city that once set the standard for the Cantonese-speaking community. "It is a common practice; many schools are doing the same," said Yao Cheuk, an artists' agent in the city. "They are doing this because it is national policy to promote Putonghua. From time to time, there is news that kids got punished for speaking Cantonese in schools. It is outrageous. They are eliminating Cantonese." Angry about the official bias, Yao went on to explain the superiority of Cantonese, which he described as a more mature language with a richer linguistic history than Putonghua. He cited soccer player David Beckham's name to illustrate his arguments. Cantonese translates his family name using two characters, while Putonghua uses four. He pointed out that Putonghua has only 23 vowel sounds, while Cantonese has 59, leaving Putonghua relying heavily on the context for meaning. Yao's friend, surnamed Pang, stressed they were not anti-Putonghua. "Language is for people to communicate. I speak Putonghua whenever there are people whose native tongue is not Cantonese," the college student said. "Kids will do the same when they need to communicate with their friends. Why force us to abandon our native language?" Both insist on using Cantonese pronunciations to spell their names in English. Pang and Yao are among a group of Guangzhou natives who fear for the future of Cantonese in the capital of Guangdong. Their worries are not without basis. For example, more than 80 per cent of cabbies do not speak Cantonese and often drivers will suggest that Cantonese speakers use Putonghua for directions…. Pang, Yao and their friends believe Putonghua speakers in Guangzhou already outnumber Cantonese speakers, because of the influx of migrants from other parts of China and the national policy of promoting Putonghua. The trend, they say, will continue, leading eventually to the extinction of Cantonese in Guangzhou…. Cantonese is regarded as a modern variation of the ancient Han language, said Roxana Fung, an assistant professor at Polytechnic University's department of Chinese and bilingual studies. The Cantonese system – pronunciations, vocabulary and usage – is very similar to the official language used during the Tang dynasty (618-907)…. Professor Fung does not want to see Cantonese eliminated. "Dialects are language fossils, they keep many characteristics of the ancient language. Through dialects, we can understand many ancient scripts," she said. A new craze is sweeping through the ranks of Shenzhen's teenagers. Whether it is in school, at the shopping mall or the KTV club, there's only one way to prove you are a real "Shenzhener" – by speaking Cantonese. In the past couple of years, there has been growing concern that regional dialects are being lost to the relentless tide of Putonghua. But in Shenzhen, many immigrants are swimming against the current. Li Zhen is a 16-year-old high school student who was born in Wuhan and moved to Shenzhen at the age of 10. She insists on talking to her friends in Cantonese. "My parents do not speak Cantonese and we speak Putonghua or Wuhan dialect at home," Li said. "But in school, we only speak Putonghua in class. All my friends are Cantonese speakers. Cantonese is the fashionable language among Shenzhen teenagers." Li's friend, Wang Zijing, said speaking Cantonese made them feel more international. "Being bilingual, we feel we have more in common with international cities such as Shanghai, Hong Kong or New York than with people from the hinterland who can usually only speak Putonghua," she said…. There is a two-pronged attack on the local language – internal migration on the one hand, and central government policies of a "common language for a unified country and harmonious society" on the other. In the 1980s, the universal adoption of Putonghua was enshrined in the constitution and in all schools from kindergartens up. In the 1990s, local dialects were even banned in many provincial and state-controlled television stations…. But things have taken an interesting turn in the past decade. As the second generation of migrants grows up, they are embracing Cantonese culture and language. "We feel no different from Cantonese natives," Li said. "We speak Cantonese with no accent. We watch Hong Kong television dramas. We enjoy Cantonese cuisine such as herbal tea and fish balls. We sing old Cantonese songs at KTV. But actually, we are Shenzheners, or new Cantonese." …In Guangdong, while the official policy of promoting Putonghua over local dialects remains unchanged, officials are increasingly putting emphasis on developing "Lingnan [Cantonese] culture". The reasons behind this go beyond pride in the indigenous culture. Guangdong leaders – many of them migrants from other provinces – are starting to realise the role of culture in social and economic development. There have been concerns that the Pearl River Delta is falling behind the Yangtze Delta in attracting skilled workers and top talents, all because of a perceived weaker cultural environment. In response, Guangdong invests billions of yuan in cultural development each year. The result is a wave of cultural propaganda showing off ancient Cantonese culture. But to return to the anti-topolect slogan in Taipei Storyland with which I began, the National Language Movement (GUO2YU3 YUN4DONG4 國語運動) has a history going back even before the beginning of the Republican Period in 1912. When the Guomindang (Kuomintang / KMT) was defeated by the Communists on the mainland and retreated to Taiwan, they brought Mandarin with them and promoted it rigorously. In the 50s and later, it was illegal to speak Taiwanese in schools, universities, and other public places. During this period, one could even be put in jail for compiling Taiwanese language teaching materials (I know someone who was incarcerated for having done so). Under President Chen Shui-bian, Taiwanese, Hakka, and even the aboriginal (Austronesian) languages experienced a strong revival. Now, however, Chen languishes in prison under a life sentence, the KMT is back in power, and Mandarin is being promoted vigorously. Hence the slogan pasted on the window frame in Taipei Storyland. In a paper entitled "How to Forget Your Mother Tongue and Remember Your National Language" that I published on the Web, I attempt to put the dialectical dance of the "dialects" with Mandarin in historical and linguistic context. 1. I don't see how a language with 70 million speakers can be really endangered. 2. Otoh, if Beijing were to relax its manderin policy a little, it might be able to score a propaganda victory over Taipei by suggesting that reunification would reduce lingusitic opression. Actually, what China has done in response to Holo Taiwanese promotion under the Chen administration was to do the same thing in Southern Fujian, publishing S. Min textbooks and setting up a dialect preservation zone as well as pushing S. Min related cross-strait performances. Most of this was for show, but it's an interesting response and part of the Chinese pattern of trying to tell Taiwan, "nothing about you is different from us." Second, of note: the Ministry of Education in Taiwan has recently finished announcing a set of standardized characters that make it possible to write Holo Taiwanese, in Hanzi. Finally, one should note that Taipei Storyland is a place that preserves things from the past. 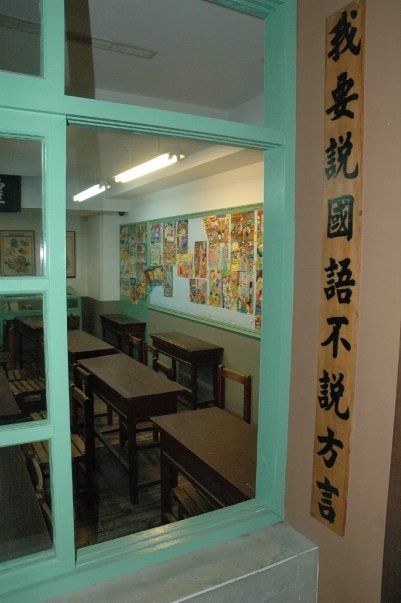 These Guoyu promoting signs are never seen in modern settings, schools or otherwise; they remain in Taipei Storyland to remind us of how the KMT promoted Mandarin in the past. And while the KMT is still trying to promote Mandarin and Chinese history over local languages, literature and history, just look at how the KMT speaks more and more Holo Taiwanese as election day nears. I don't know. Wu has 70 million speakers and it often feels pretty endangered to me. The fact that it's reduced in many people's minds the way Ebonics/AAE is in America, as "just bad English/Mandarin", even the speakers of the "bad" "dialect" themselves, makes me worry though only slightly. I never understood why Beijing didn't embrace the awesomeness of linguistic diversity, though I suppose no one (i.e. Beijing) wants a bunch of un-unified Han people running amok. that should read "…even TO the speakers…"
"Dialects are language fossils, they keep many characteristics of the ancient language. Through dialects, we can understand many ancient scripts," she [Roxana Fung, an assistant professor at Polytechnic University's department of Chinese and bilingual studies] said. Assuming this is is the correct text of the article, I wonder what exactly Prof. Fung means by this – can anyone offer any insight? As an aside, the discourse surrounding the Cantonese-Mandarin tension reminds me of the discourse surrounding Standard (Tokyo) vs. Kansai (Osaka, Kyoto) Japanese (and probably other situations where there is a non-standard/non-official dialect that carries quite high prestige). Similar stories about how Kansai Japanese could have become the official variant if only things had played out a little differently, and similar reports about speakers of other less prestigious non-standard variants preferring to orient themselves towards the most presigious non-standard (Kansai) than the standard. A follow-up: my underlining disappeared, but the part of Prof. Fung's quote that I didn't understand was how exactly 'dialects' can help us to understand ancient scripts. @jo: When Prof. Fung says "dialects," she probably means just "Chinese dialects" (or "Chinese languages and dialects," which some prefer). I'm not sure how familiar you are with the Chinese language family, but the most important thing to know is that it is composed of several varieties, many of which are mutually unintelligible. Classical Chinese (perhaps more accurately Literary Chinese, but some don't make a distinction) was used for nearly all (formal) writing up until the last century. The story is much like Latin compared to the Romance Languages just a few centuries ago: the languages people actually spoke (what became Spanish, French, etc. for Romance or Mandarin, Cantonese, etc. for Chinese) became different, as languages do, from the older form (Latin, Classical Chinese), even though the older form was still often used for formal/written correspondence. If we pretend that Chinese is the Romance Languages, then, Fung's claim is essentially something like "Reading Latin is easier if you speak Italian than if you speak French" (I'm not saying that's true or equivalent in validity to Fung's claim, but this is the kind of argument she's making). Of course, when we talk about reading, Chinese is different because the writing system isn't based on pronunciation (phonemic radicals aside), so unless you don't recognize a character, it's entirely possible to read Classical Chinese in your modern tongue. Whether it will make sense or not depends on how much the grammar has changed, and whether it rhymes depends mostly on how phonology has changed. Fung's claim probably rests mostly on the idea that the phonology of Cantonese is more similar to Classical Chinese than is Mandarin's—which is probably correct given how much Mandarin's phonology has simplified (Cantonese permits more syllable codas, for example). I should clarify: Fung probably takes "dialects" to mean "all varieties of Chinese *besides* Mandarin." Some of these varieties may be closer (phonologically, grammatically, etc.) to Classical Chinese than Mandarin, so I think she is mostly saying that, if you don't know the Classical language, sometimes a "dialect" will allow a better reading of the script (for example, because you'll understand that it rhymes) than Mandarin will. Essentially, I think Fung is making one more argument against the push for "everybody speak only Mandarin" by showing how some people's regional varieties can be useful for reading older Chinese, which is likely considered important culturally, and she hopes this argument will dissuade the government (or anyone) from trying to eliminate other varieties. The language I've done fieldwork on for the past 5 years, San Martín Itunyoso Trique, is spoken in a little town in Oaxaca, Mexico with about 2,500 speakers. Everyone in the town speaks the language, including all the children. In fact, most children don't learn any Spanish until they attend primary school. I wouldn't call this language endangered. (It is perhaps slightly threatened by Spanish's gradual dominance in all of Mexico.) However, the number of speakers does not determine whether or not a language is endangered. There are plenty of cases of stable linguistic communities with far fewer speakers than those found in San Martín Itunyoso (perhaps only a few hundred). What seems to matter more is the language-external attitudes towards the language. When the attitude is one of "live and let live", languages can remain stable for at least a while. (In truth, it is more often "live and only pester from time to time".) When the attitude is one more strictly enforcing a "speak only English" or "speak only Putonghua" policy, this can result in rapid language loss and extinction. In fact, this was exactly the policy until the 1960's in the US towards American Indians in boarding schools. We all know how this turned out. Punishing or humiliating school children for speaking foreign or non-standard languages is certainly a common technique that can make widely spoken languages and language varieties endangered in the space of a generation or two. It was widely applied in Europe up to the 1960s, and substantially contributed to the decline of Breton, Alsatian, Sardinian, and many other languages that were thriving only 60 or 80 years ago. Chinese anarchists of the 1912 era advocated Esperanto as the national language. Thank you for the comment about Kanzai, jo. It's highly irrelevant here, but I'd wondered a bit about how different it was from 'standard' Japanese due to some jokes about it in a manga series I've just picked up. But it's obviously one of those jokes that don't translate all that well. At least the publishers have chosen to stick with Japanese names and references, rather than try to make them topical for Danish, but they're a bit lacking in the footnote department unfortunately. I have never understood why a culture that is normally so proud of big numbers (1.6 billion people, 5000 years of history, 35,000 characters) suddenly develops an allergy to big numbers when it comes to languages. Instead of pretending that Chinese is just one singular language, why not celebrate the multitude of Chinese languages? The Chinese should be bragging about having many Chinese languages, rather than suppressing them. – I think the SCMP article's claim that Cantonese is having some sort of resurgence in Shenzhen is rather innaccurate. The phenomenon of children speaking Cantonese at school and among friends but Mandarin or their native topolect with their parents was prevalent when I first arrived in SZ in 2000, and I'm sure that it was not new then. This type of diglossia extends beyond the class room, too. Though it's only anecdotal, I know of recent arrivals to Shenzhen being told by their managers (both local, from HK, and otherwise) that they had to learn to speak Cantonese if they wanted to make it at their new company. – That students have been punished for speaking Cantonese at school is news to me. Usually, there is a very clear distinction, with Mandarin spoken in class by both teachers and students (well, except for the smartass comments students say under their breath) and Cantonese spoken outside the classroom. – Interestingly, in Sichuan there are also banners instructing people to "be a civilized person, speak Mandarin" but there doesn't seem to be much effort to get people to speak Mandarin. Then again, it's sometimes hard to tell if a local is speaking Mandarin. What seems to matter more is the language-external attitudes towards the language. Totally agreed. Even if a language has 70 million speakers, as Cantonese does, it's possible for it to be endangered if there is significant pressure from both within the language community and the national powers-that-be, to move toward a standard. In determining a language's health, far more important than the absolute number of speakers a language has, is the rate of juvenile acquisition. Most Australian languages had around 200 speakers prior to European contact, but the speech communities were stable. As an aside, many are now moribund. Wagiman, for instance, has four competent speakers left. Of course, languages with so few speakers to begin with are probably much more likely to succumb to the overwhelming cultural pressure to shift to the national or regional prestige language. Can this really be right? 59 distinct vowel sounds? Or does the person really mean syllable codas, or something else? @jacob – The danger in this line of argument is that national fanatics and bullies can apply it in reverse, to impugn political motives to simple descriptions of language. Besides, even if one accepts Andersen's ideas (just for the sake of argument), one has to ponder what brand of "nationalism" it is that seeks to suppress entire Chinese languages, supposedly with the goal of preserving the central polity. That's a destructive kind of nationalism. Think about it: What people are trying to wipe away Chinese languages? Chinese people, that's who. Are these people "patriots"? With countrymen like this, who needs foreign devils? I think it is misleading to talk about finals alone, since one should also consider the # of initials. Also note, some combinations of initials and finals are never used. However, the point I really wanted to discuss was the claim that Cantonese is better than Mandarin for transliterating English names. Cantonese does have more finals which end in consonants (I don't think Mandarin can end in m, p, t, or k). However, Cantonese does not have an "r" or a "sh" sound, so that makes it pretty useless with other names. I think the example of "Beckham" had to be very carefully picked. And languages shouldn't really be judged on the basis of which can transliterate names from foreign languages, should they? "A follow-up: my underlining disappeared, but the part of Prof. Fung's quote that I didn't understand was how exactly 'dialects' can help us to understand ancient scripts." I think Prof. Fung must be suggesting the utility of comparative study of Chinese dialects/languages for reconstructing how much older variants of written Chinese might have been pronounced–kind of like reconstructing proto-languages. Study of Japanese and Korean can also contribute to this effort–looking at the introduction of Chinese vocabulary and their approximate pronunciations in those languages. The Wikipedia article on "Historical Chinese phonology" offers some basic info (http://en.wikipedia.org/wiki/Historical_Chinese_phonology). In addition to the national language's role as a "unifier" of all Chinese citizens (regardless of ethnicity), I think an important aspect of promoting Mandarin and relativizing languages like Cantonese as "dialects" is maintaining the dubious claims of a cohesive and united "Han ethnicity." The promotion or flourishing of Chinese languages other than Mandarin (Wu, Cantonese, Min, Hakka, Xiang etc.) opens the door for questioning the validity of the ideology of Han ethnicity. If the numerical strength of the "Han" in China (where Han account for 92% of the population) is diminished by, say, recognizing Cantonese and other groups as separate ethnicities (with their own language to prove it), it becomes more difficult to suppress Tibetan or Uyghur claims to independence. Indeed not; only n and ng occur (well, and there's the syllable transcribed er) besides vowels (including di- and triphthongs). Cantonese has m, n, ng, p, t, k, and vowels as syllable endings.